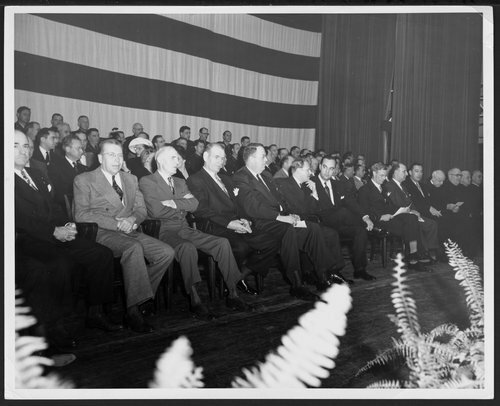 This black and white photograph shows Governor Frederick Hall sitting in the center during his inaugural celebration. To the right of Hall is the thirty-second Governor of Kansas Edward Arn, who was in office from 1951 to 1955. Hall, an attorney from Dodge City, Kansas, began his political career when he sought the Republican nomination in 1950 for lieutenant governor. Government and Politics - State Government - Governors - Arn, Edward F.